The NFL Players Association recently announced a partnership with the on-demand care service company, Uber. By using Uber’s mobile app, users can request a car service (clean black car) for pickup. Uber uses GPS to locate the user and all the person has to do is press a button to request a ride. And no cash is necessary as your credit is billed automatically when your ride is completed. The fares can be 50-75%, but it’s worth the quality of service and convenience. With this partnership the NFLPA is looking at what they can do to improve the safety of their members off the field (This is some good news in light of the recent settlement in the concussion lawsuit) as their has been an unfortunate rise in DUI incidents associated with NFL players. Currently Uber is available in 17 of 31 cities where NFL teams are located. Markets like Houston and Miami have been tough for Uber to crack as they do not allow competition to taxis. With the NFLPA (and The Shield (NFL)) basically backing Uber I think it will be a matter of time before that changes. But at the end of the day it comes down to the players taking advantage of what is available to them. 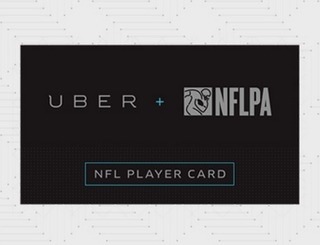 Currently the NFLPA provides car services that players can use (nothing really like Uber). It will be up to the players (and their friends who party with them) to use better judgement.